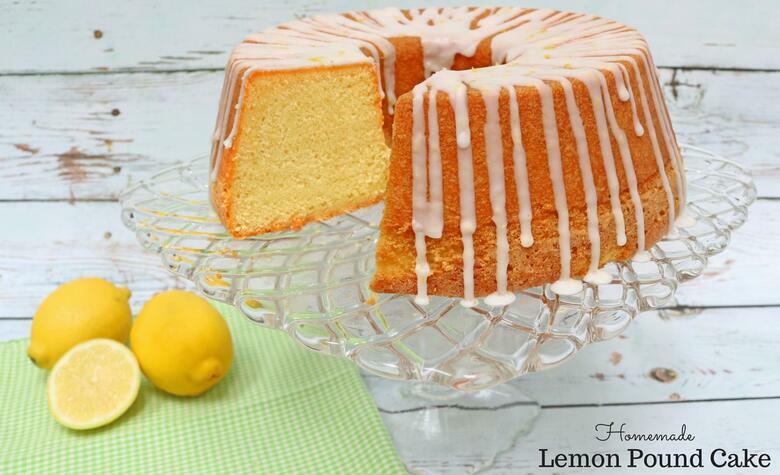 This moist & delicious scratch Lemon Cake recipe has become one of our family favorites. Not only are these homemade lemon cake layers delicious, but a simple lemon curd filling and lemon cream cheese frosting bring a triple dose of lemon to this fantastic dessert! 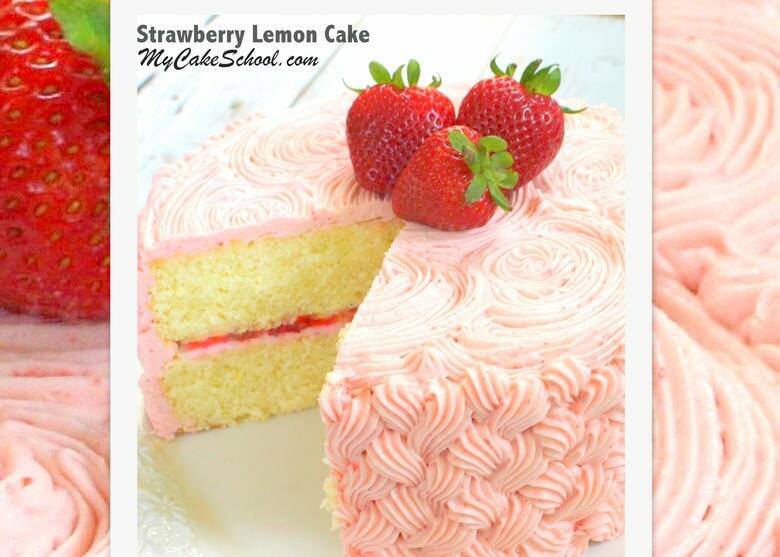 I love lemony desserts and am always looking for an excuse to make this cake! 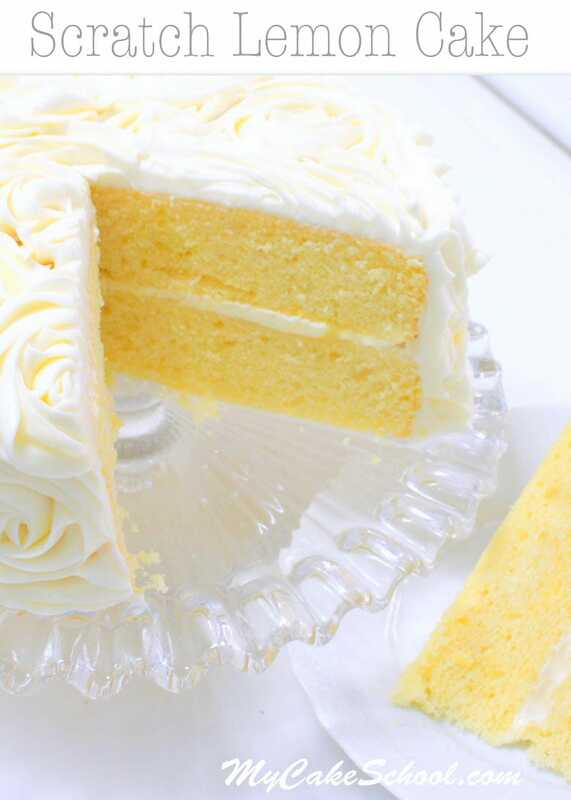 Over the years, this scratch lemon cake recipe has become one of our most popular on our site. There’s just something about lemon, isn’t there? Mmmmm…. One of my favorite things about lemon cake is that it pairs wonderfully with so many flavors, including raspberry, blueberry, coconut, lime, and strawberry! However, for today’s lemon cake, we’re pulling out all the stops and going FULL Lemon with a dreamy Lemon Curd Filling and my FAVORITE silky smooth Lemon Cream Cheese Frosting! Our Lemon Cake recipe is one of my favorite year-round desserts, but it is an especially popular choice for spring and summer gatherings, when everyone’s cravings for light and citrus filled desserts are at their highest! While the lemon cake layers are the stars of the show, the homemade lemon curd and lemon cream cheese frosting are each so delicious that you will be tempted to forget the cake & just grab a spoon! Lemon Lovers, you are going to want to save this recipe! 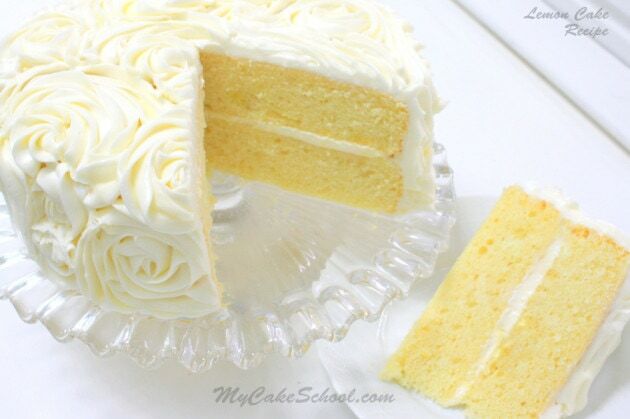 We frosted our cake with this flavorful, simple Lemon Cream Cheese Buttercream Frosting Recipe. I just can’t get enough of delicious cream cheese frosting recipes! This is definitely a keeper. 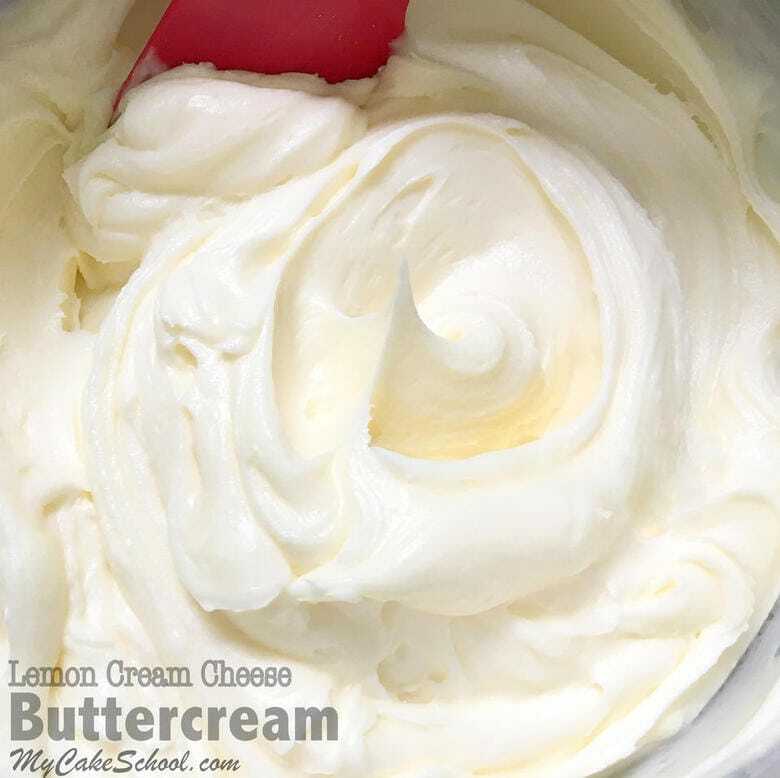 However, if it’s buttercream that you are looking for, especially one that pipes perfectly and tastes amazing, look no further than our Lemon Buttercream Frosting Recipe! After baking our two lemon cake layers, we allowed to cool for about 15 minutes on the wire rack before flipping them out and wrapping the layers in plastic wrap and then aluminum foil. Wrapping the cakes while still a bit warm and then placing them in the freezer is a great way to make your layers even more moist! If you are working in advance, you can freeze your cake layers for up to three months, and then allow them to thaw on the countertop when you are ready to use. We thaw our cake layers on the countertop while still wrapped…for about thirty minutes or so and unwrap as condensation begins to form on the foil. (It’s better for the condensation to form on the wrapping than on the cake itself! I think it’s easier to assemble and fill the layers while they are still partially frozen or at least well chilled since the layers are less fragile. When you are ready to assemble the cake, pipe a dam of the lemon cream cheese frosting around the outer edge of the bottom cake layer– we pipe about 1/4 inch from the edge. Then, spread the cake layer with a thin coat of lemon curd. Follow that by spreading on a layer of lemon cream cheese frosting. 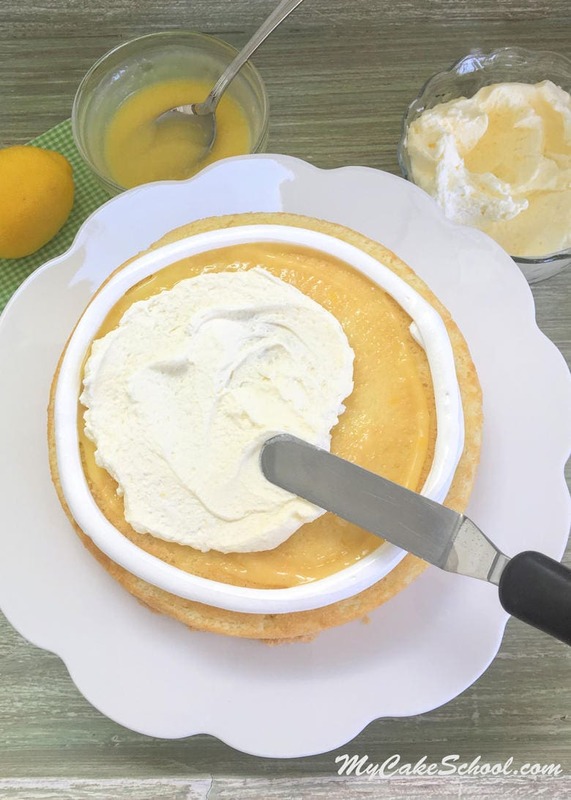 You may find it easier to pipe a spiral of lemon cream cheese frosting on top of the lemon curd, and then lightly spread it with an offset spatula. Then, add the next layer of cake. Once the two layers are stacked, I like to pipe lemon cream cheese frosting in the gap between the two layers to make sure that the filling is well sealed inside. *One note about the filling…it is SO good that you will be tempted to really slather it on thick between the layers. However, doing this will make your layers more likely to slip in slide. Next, we crumb coated the cake with a thin layer of Lemon Cream Cheese Frosting, and followed immediately with large rosettes piped using a large star tip (1M or 2D). *As with any of our scratch cake recipes, we highly recommend measuring the ingredients (especially dry ingredients) by weight with a kitchen scale. This will ensure that you are using the intended amount of flour, etc. However, if you do not have a digital scale, lightly spoon the dry ingredients into your measuring cup and slide a knife across the top to level. This is a much more accurate way to measure than “scooping” the ingredients, which will give you more than the intended amount. Make sure to put a digital scale on your wish list if you don’t have one–they are very reasonably priced and SO helpful! Looking for a fabulous Lemon Cake that starts from a box mix Instead? 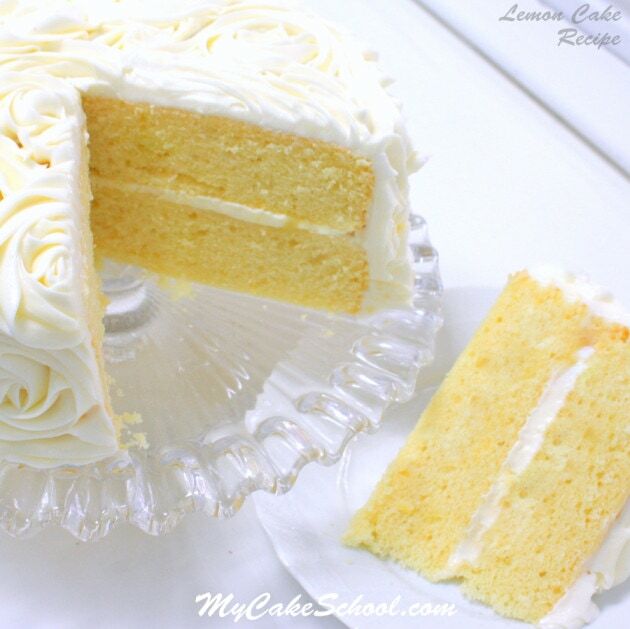 This light and lemony scratch lemon cake is so moist and flavorful! I love it year-round, but especially in the spring and summer months! This has been one of our most popular recipes over the years! *** ** If you don't have cake flour, for each cup of all purpose flour (or plain flour in the UK) remove 2 Tablespoons of flour and replace with 2 Tablespoons of cornstarch. For this recipe, measure out 3 cups all purpose flour, remove 6 Tablespoons and replace with 6 Tablespoons cornstarch. Whisk to blend. Grease and flour two 8 inch pans ( my pans are 2 inches deep). You could also divide the batter between three 8 inch pans for slightly thinner layers which allows for an additional layer of filling. In a medium sized bowl add the flour, baking powder, baking soda, salt and zest of 2 lemons. Whisk to blend and set aside. 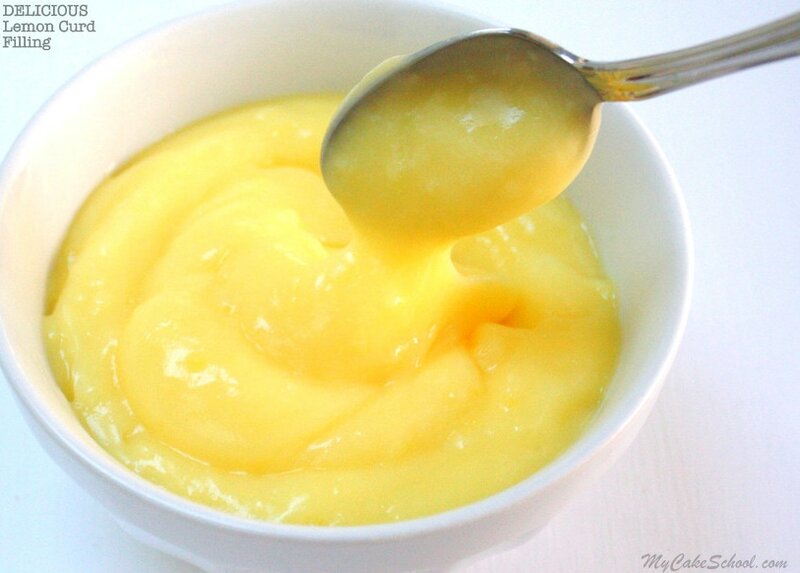 In another bowl, add the milk, vegetable oil and lemon juice, and lemon extract. Whisk to blend and set aside. In the bowl of your mixer, beat the softened butter until smooth. Gradually add the sugar and mix on medium speed 3 to 5 minutes until it is lightened in color and fluffy. Add the flour mixture and the milk mixture alternately. Begin and end with the flour (3 additions of flour and 2 of milk). Mix until combined and smooth, do not mix above medium speed or over mix. Pour the batter into the prepared pans, smoothing the tops with the back of a spoon. Bake at 350 degrees. If baking three 8 inch pans, bake at 350 for 20-25 minutes. For two 8 inch pans, bake at 350 for 30 to 35 minutes or until a toothpick inserted in the center comes out clean or with only a few crumbs attached. Let the cakes cool in the pans 10 minutes then turn out. For the cake pictured in this post, we piped a dam of lemon cream cheese frosting about 1/4 inch inside the edge of the first layer. We spread a thin layer of lemon curd frosting, piped and spread a layer of lemon cream cheese frosting on top of it, and added the top cake layer. We thinly crumb coated the cake with our lemon cream cheese frosting before piping large rosettes all over the cake (use a 2D or 1M tip). If you’re looking for something to pair with your lemon cake other than lemon flavored fillings and frostings, we also love this Strawberry Lemon Cake! This cake with it’s unique and delicious combination of flavors is sure to become a favorite! We also love this Lemon Blueberry Cake Recipe from scratch! There’s just something about the combination of lemon and blueberry– it’s the PERFECT combination of flavors! 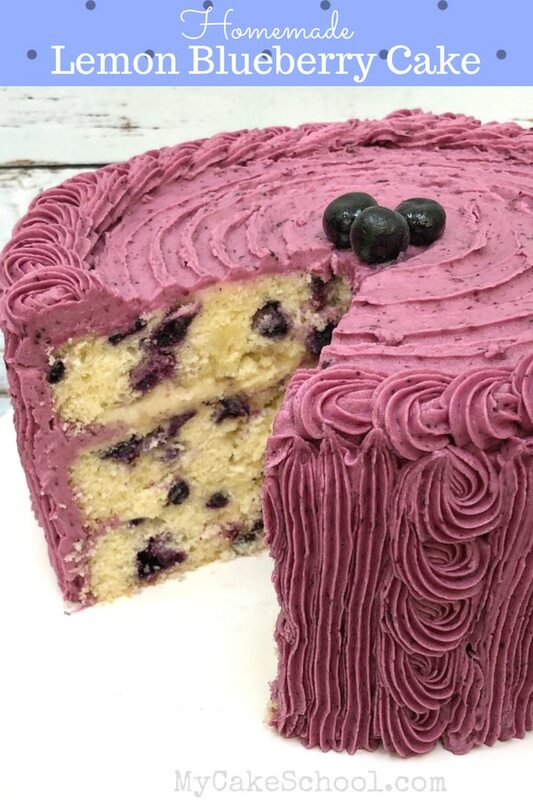 This cake also features lemon cream cheese frosting and a delicious Blueberry Buttercream! Finally, I have one more lemon cake recipe to share! This easy Lemon Pound Cake recipe is a classic! If you are a fan of pound cake and lemon, you are going to fall in love with this recipe! Thanks for stopping by! Don’t miss our full collection of the BEST cake and frosting recipes in our Recipes Section! We also have lots of cute and easy Free Cake Tutorials in our Free Tutorials section. Finally, if you would like to have full access to the hundreds of cake decorating video tutorials that we’ve made over the years, you should consider becoming a member of My Cake School! Our site is the best, most fun way to learn cake decorating- and we have tutorials for all skill levels! Peanut Butter and Chocolate Cake!~ Recipe! Hi Lindsay, For standard size cupcakes, bake at 350 degrees for 18 to 20 minutes.